Dockwalkers are partners who inspire and educate boaters and other recreators to be safe and environmentally sound while boating in California. 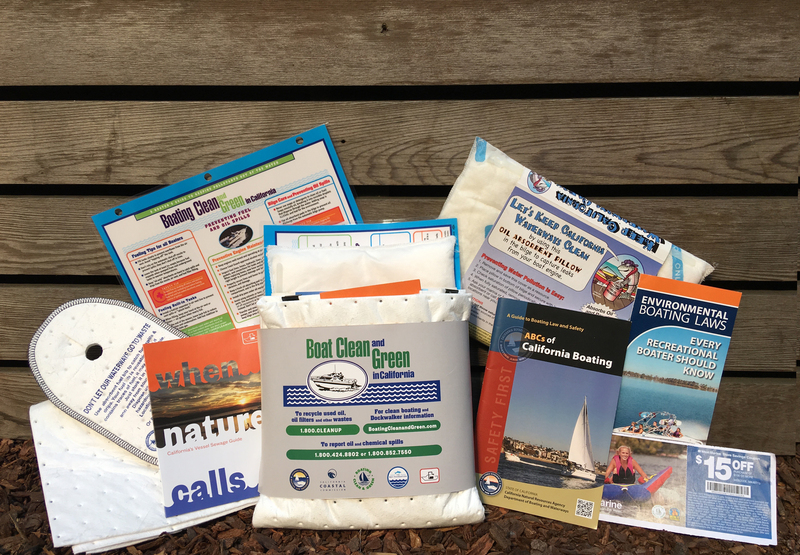 These partners distribute boater kits with educational materials anywhere where boaters are and while visiting marinas, boat launch ramps, boat shows and boating events. Who can be a DOCKWALKER? Anyone from 15 to 100 years young and interested in water quality and sharing clean boating information (regardless of your background) can become a Dockwalker! What is the DOCKWALKERS Program’s main objective? How do I become a DOCKWALKER? Contact the California Boating Clean and Green Program at (415) 904-6905 or check our list of trainings to register for a FREE 2 hour training class. Every year, 5-10 TRAININGS are conducted throughout the state. During the class participants learn about potential sources of boat pollution and their impact, state and federal environmental regulations, and clean boating practices that prevent pollution from boating. The training also covers local pollution prevention services (Ex: sewage pumpouts, used oil and used oil filter recycling, among others) available to boaters. In addition, the training provides information on how to conduct face-to-face education (Dockwalking) and an overview of the educational materials Dockwalkers will distribute including the boater kits. Age range is 15 years and up. The program can document community service hours. By creating a corps of clean boating educators, the program vastly expands the outreach potential of the Boating Clean and Green Program and its partners. It also promotes collaboration between the Program and local, statewide and regional organizations in conducting outreach to boaters. The training is designed to promote the main educational messages of the Boating Clean and Green Program. What is a Boater Kit? The boater kit is the main outreach tool for Dockwalkers and it is an educational tool for a boater that promotes safe and environmentally sound boating practices. 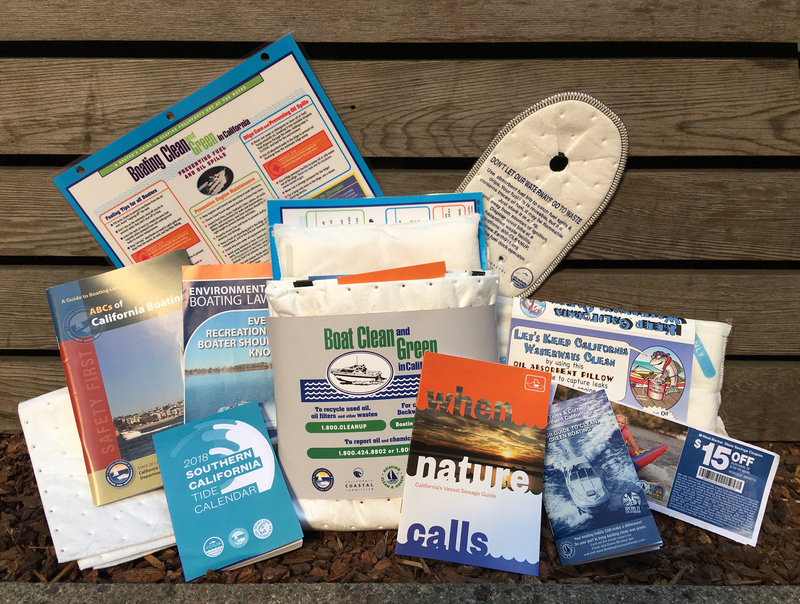 Based on research conducted by the Boating Clean and Green Program and its partners, the kits were designed to give boaters something that will prompt them to take action and carry out at least one of the recommended practices promoted through the program. As a key component of the kit, absorbents focus on some of the primary messages of the Program, which relate to oil recycling, preventing oily discharges and other aspects of boating and oil-related pollution. In addition, the kits are designed to promote environmentally sound boating by providing other educational materials. Materials include publications (boating safety course, ABCs of the California Boating Law, Clean Boating Habits, etc. ), clean boating maps and/or the Southern California Boater Guide (created by The Bay Foundation and funded by the Division of Boating & Waterways from the Clean Vessel Act Grant Program (dependent on region). During the Dockwalker training class you can take some boater kits with you or place your order. You are welcome to order more kits once the completed boater questionnaires are returned to the program manager. Boaters can receive a boater kit after completing a brief boater questionnaire/pledge. This questionnaire will help to identify gaps in environmental services and better target future boater education efforts. What is a Recreational Boater Questionnaire? The training is valid for three years. During the three years, you can order boater kits by simply contacting the program manager Vivian Matuk at (415) 904-6905 or vmatuk@coastal.ca.gov. You can conduct Dockwalking visits (face-to-face education) on your own at marinas, boat launch ramps and fuel docks. You can also participate at local boating events such as boat shows, fishing derbies, poker runs, fairs and other boating events. You may also conduct a clean boating presentation at your marina or yacht club and talk to several boaters at the same time (Massive Dockwalking). Any locations where boaters are provide a great opportunity for Dockwalking. Also, find out about local events and festivals by contacting local boating publications, marina operators, and yacht clubs, among others. How have DOCKWALKERS made a difference? Research developed by the Boating Clean and Green Program and its partners showed that boaters who received the boater kits and the face-to-face boater education tended to be much more likely to implement environmentally sound boating practices such as using oil absorbents, taking precautions to prevent fuel spills (including not topping off their fuel tanks in the water), and recycling used oil and filters. By talking “face-to-face” to boaters at docks, launch ramps, and other waterfront areas, Dockwalkers have demonstrated their ability to motivate behavior change in the boating community. Since 2000, more than 100,000 boater kits have been distributed throughout California. The program is building partnerships and is fostering community involvement. It is important for all of us to remember that we must keep working on boating education because education is the key to success. Boaters are known to be good stewards of the environment. The Dockwalker Program wants to help boaters by providing needed information, and connect them to the pollution prevention services available to them. The Dockwalker Program provides this information and an opportunity to boaters to further their knowledge and help bring awareness and education to other boaters concerning environmentally-sound boating practices. The efforts of Dockwalkers increase boater awareness about clean and safe boating, thus improving the recreation experience in California while helping to preserve its precious wildlife habitat and water quality. Since the year 2000, more than 900 volunteers have become Dockwalkers and approximately 100 to 150 are active every boating season. Dockwalking is a fantastic way to interact with boaters to help keep California’s marinas, waterways, and ocean clean and healthy. Anybody who loves the water is welcome to join this program and help us to promote clean and safe boating practices. Marina/Yacht operators believe that education is critical to successfully operating a clean boating facility and minimizing water quality impacts. Becoming a Dockwalker or having a staff person or yacht club members trained as Dockwalkers will provide you with the educational materials and tools to work with your tenants and visitors as partners in the clean marina/yacht club, clean water effort. This program provides marinas with points towards the clean marina designation. Participation in the Dockwalker Program counts towards the nomination of the Club of the Year under the community service category. Safety organizations such as the US Coast Guard Auxiliary and US Power Squadrons also benefit from the program. For US Coast Guard Auxiliary, The Dockwalker program is consistent with the Coast Guard marine environmental pollution message and fulfills your commitment to carry out the mandate of the Commandant of the Coast Guard. The Dockwalker program complements the USCGAUX Vessel Examination program, supports Public Affairs/Public Education events, and counts towards the annual Marine Safety service requirement for the TRIDENT program. Hours of Dockwalking may count towards earning the Aux Recreational Boating Safety Insignia. For US Power Squadrons, the Dockwalker program is consistent with the US Power Squadrons mission of Making the Water a Better Place. The program is endorsed by USPS National, CA USPS. Becoming a Dockwalker will provide you with educational resources for the safety classes, vessel examinations, boat shows and other public events and presentations. This program will support your current efforts, enhancing and broadening your boating safety mission and will provide USPS with additional tools to protect our waterways. Finally, working as a Power Squadron member for the Dockwalker program counts as effort toward a Merit Mark.